A new study shows a marked decrease in the number of polar bears in the Arctic’s southern Beaufort Sea during the 2000s, a period when summer sea ice was also declining. Scientists estimate the population of polar bears in the area north of Alaska and northern Canada declined by about 40 percent from 2001 to 2010. By tagging and recapturing polar bears over the years, researchers were able to estimate the changes in population size over the decade. Jeffrey Bromaghin, a research statistician for the United States Geological Survey and lead author of the study, told The Huffington Post it’s likely that loss of sea ice during the 10-year period led to the starvation of many of the bears. “We suspect the primary cause of reduced survival and population decline was starvation, due to climate-induced sea ice conditions that reduced access to seals,” Bromaghin told HuffPost. “During the lengthening open water period, most bears in the southern Beaufort Sea stay on the remnant ice far from shore where few seals are thought to occur.” Essentially, the bears were forced farther away from their food source. The decline in the number of polar bears over the 10-year period was not constant. The bears’ survival was particularly bad during the middle of the decade, and cubs had an especially difficult time. From 2004 to 2007, only two of 80 observed cubs were known by researchers to have survived. Later in the decade, polar bear survival improved and the population stabilized around 900 bears in 2010. Polar bear population dynamics are complex, Bromaghin said. “We know that polar bears cannot survive in anything like their current distribution or numbers without adequate sea ice, but we do not know everything we need to know about how the ecological changes stemming from climate warming and sea ice loss may ultimately affect polar bears.” Given that warming is expected to continue, however, Bromaghin and Amstrup both said sea ice loss will likely become the main factor in how many polar bears survive. 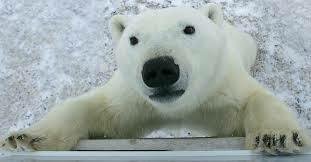 In 2008, polar bears were listed as a threatened species under the U.S. Endangered Species Act because of the likelihood that loss of sea ice would cause the bears to become endangered in the future. Amstrup told HuffPost that upgrading the listing of polar bears to endangered is “more of a legal and definition issue” that is beyond the scope of the study, but he did note that conservation of polar bears and other species threatened by global warming poses a unique challenge because their habitat can’t be protected by simply fencing it off. Article from The Huffington Post and written by Katherine Boehrer, November 18,2014. The study was published online November 17th in the journal Ecological Applications.